Professional Server Certification Corporation (PSCC) offers nationally recognized trainng for bartenders, waiters, waitresses, sellers, and servers. Our courses are designed to give individual bartenders or servers the ability to get their certification online as well as giving employers the ability to have their entire staff of bartenders, waiters, or waitresses certified through our program. Our course has been reviewed by liquor liability insurance companies to ensure that it is aligned with the national standards for alcohol seller/server training. Verify with your state's alcohol board for more information about seller/server certification. PSCC is one of the only trainers with toll free telephone support. We are in the office 12 hours a day and glad to help you if you have any problems while taking the course. We have owned and operated traditional bartending & hospitality training schools in metropolitan cities since 1987. PSCC is not just another online bartending school! 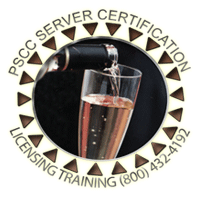 PSCC works with state liquor control boards to ensure that PSCC courses meet state requirements.